One of the joys of working at Penpergwm House is coming to appreciate the vast and wonderful life stories of many of our residents. The splendorous uniqueness that make up these stories, not only compel us to think of our own lives, but rather celebrate the memories and experiences we all share. This coming together through the passage of time causes us to stop and reflect occasionally, and never more so when gazing into photographs of the distant past. In the picture Roger is sat in his canoe, rucksack full; he appears slender, tanned, prepared. It is not clear if the photograph was taken on his maiden voyage up one of Britain’s most picturesque waterways but the look upon his face is one of each day’s experience would be unforgettable. 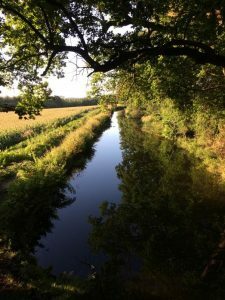 We talked at length about what it was like meandering up the canal each day, taking in the wildlife and the abundant beauty of nature on all sides. Calling in to canal-side pubs for a drink or settling down to a meal cooked over a camp fire. I asked him would he like to do it again. Without hesitation, of course, he said he would. In his eyes at that very instant I recognised almost a reflection, like a retinal daguerreotype, the mercury vapour of his memory shining outwards and appearing exposed for us both to see. As is often the case, some memories are too difficult to illuminate, the qualitative essence for the individual too inexplicable to share. Yet I feel sure that Roger wouldn’t mind in the least if my own image of the canal is suitably aligned to his. It was a lovely surprise to see dads photos and story on your website today and to hear his recollections on his canoeing. It’s lovely to also see all the other pictures. It’s reassuring knowing he’s being looked after so well. Thank you for all you do for him. It is our pleasure and we are so delighted you have enjoyed us sharing it.